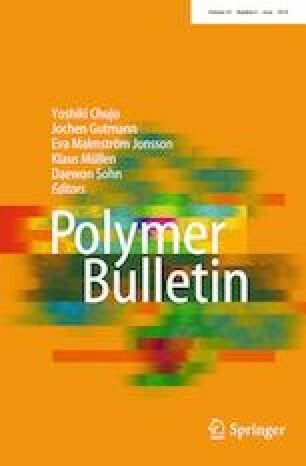 Propylene-based random copolymers copolymerized by propylene and ethylene (PEC) with low degree of crystallinity were used for the modification of isotactic polypropylene (PP) in this work. The phase morphology, miscibility, mechanical properties and rheological properties of the PP/PEC blends were systematically investigated. Dynamic mechanical analysis (DMA) and differential scanning calorimeter (DSC) results verified that the blends were partial miscibility. This may be due to the fact that the PP segments from PEC chains are incorporated into crystal lattice of neat PP, and they together act as a matrix of the PP/PEC blends. The rest of the PEC chains serve as the dispersed phase. The segments from the PEC chains incorporated into pure PP play the role of compatibilizer between the PP matrix and the dispersed phase, which make the dispersed phase to be uniformly dispersed in the PP matrix, resulting in an increase in impact strength from 5 kJ/m2 of neat PP to 40 kJ/m2 of blend with 20 wt% PEC. In addition, the viscosity and modulus of the blends were lower than that of pure PP due to the dilution of PEC in the molten state. This work is supported by program of Cooperation of Hubei Province and Chinese Academy of Sciences, Jilin Province Science and Technology Agency (20160204030GX), program of Changchun Municipal Scientific and Technologic Development (16SS16) and Innovation team project of Beijing Institute of Science and Technology (IG201703N).